Upon entering, untie your boots and stash them away under the comfortable entryway bench. Head up the stairs and step right into the bright living room with a grey fabric couch and a leather chair facing the stone fireplace, where you can keep warm while watching the flat-screen TV. Enjoy the 7.1 Home Theater System, High speed wireless internet, Blu-Ray/DVD Player, Books, Games and DVDs. Dark wood floors flow from the living room to the large open kitchen. Loaded with stainless steel appliances and utensils, this kitchen is perfect for cooking up a meal after a day on the trails. Tan quartz counters continue into a breakfast bar with two leather bar chairs. The convenient half-bath is also located off of the kitchen. The dark wood dining room table with seating for six sits under an ultra-charming vaulted wood ceiling. A balcony is accessed from the dining room and has a bar height iron table that seats two and features a gas grill for alfresco dinners while looking out at the mountains. Up the spiral staircase is the birdhouse master bedroom where a queen-size bed sits on a handmade tigerwood frame. Sliding doors lead to a quaint and private balcony. The master bathroom comes with a luxury large white tub and shower. A guest bedroom features two handmade Pine twin-size beds which makes it perfect for kids. The second guest bedroom is nearby and has a queen-size bed sitting on a handmade African Rosewood bed frame. These two bedrooms share a full bathroom with two sinks and a shower/tub combo. Just steps from the Eagle-Vail Golf Course, you could spend the day teeing-off and then stroll back to your home-away-from-home to unwind. 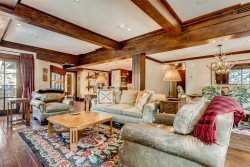 Vail Mountain at 10 minutes, and Beaver Creek Resort at 5 are just minutes away for your fill of skiing and snowboarding in the winter months, and zip lining, hiking and adventure courses during the summer. Kids will love the Eagle-Vail Pool, a gentle saltwater swimming spot heated to 85 degrees, just minutes from the rental. Highway 6, just a short drive away, is loaded with shopping and restaurants. Just 4 minutes away is the Route 6 Café, a homey spot serving American fare, and the Ristorante Ti Amo which dishes out delicious Tuscan-style food. Also nearby are a Farmers Market, the Vilar Performing Arts Center, the Gerald R. Ford Amphitheater, the Betty Ford Alpine Gardens, Walking Mountains Science Center, and Adventure Ridge. - nice selection of dvds and books including hiking guides, trail maps, and CO guide books.